Learning the notes on a guitar shouldn't take long (as little as a week) if you break it down in the way I'm about to show you. It's one of the first theory based exercises every guitarist should accomplish, after learning the fretboard basics. While it's important to learn the notes on all six strings, many find the lowest three strings (E, A and D in standard tuning) the most crucial to memorize. Why? Because these are the "root strings" from which we build the most common chord shapes and scale patterns. You can use these bass strings as reference points for playing a chord or a scale pattern in the right key. 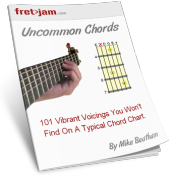 Grab your free fretboard notes print sheet if you prefer to have a hard copy. First, we need to understand what notes are and how they are written. In their most basic form, notes are the pitch of a sound. For example, play any string on your guitar at any fret and it will sound a note. There are three types of note - natural, flat and sharp. For example, an A natural note would simply be written as A. An A flat note would typically be written as A♭ or Ab. An A sharp note would typically be written as A♯ or A#. The flat note is lower in pitch than the natural note. The sharp note is higher in pitch than the natural note. We also use the terms flat and sharp when referencing a change in pitch. For example, let's say we had a sequence of notes and we wanted to communicate that one note had changed from its original position. If the note has moved down in pitch, we'd say it's been flattened (to flatten a pitch). If the note has moved up in pitch, we'd say it's been sharpened (to sharpen a pitch). So as well as flats and sharps being a part of individual note names, they also tell us where notes have moved in pitch. The note after G♯/A♭ will be the note A - the sequence repeats every 12 notes. This 12 note sequence is known as the chromatic or 12 tone scale. The pitches that have sharp and flat notes are known as enharmonic. A♯ and B♭ are the same pitch (they are enharmonic), as are C♯ and D♭ etc. Which one we use depends on a few factors and you will learn what these are as you progress. Now, you'll notice that some notes are not separated by sharps or flats - namely, B and C, E and F. This means that a B♯ would in fact be C. C♭ would be B. E♯ would in fact be F.
Contrary to common knowledge, there are instances where you would write the notes C and F as B♯ and E♯ respectively, but we'll come to all that later. All you need to know now is that the above is the natural sequence of notes to memorize when we apply them to the guitar fretboard. The open E string gives us a low E note. 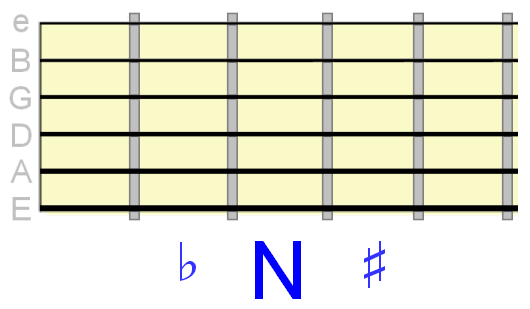 The 12th fret E is the same note, but an octave higher in pitch. Remember, the note sequence repeats beyond the 12th fret octave, so the 13th fret will be the octave of (same note as) the 1st fret F. The 17th fret will be the octave of the 5th fret A. See if you can find these note octaves beyond the 12th fret. A note on the open string. The 12th fret A is an octave higher. If you want, you can apply exactly the same method for memorising the notes on the other strings. Remember, the same sequence of notes exist on the high E string as on the low E, just in a higher octave pitch (the high E string notes are 2 octaves higher than the low E string notes). So that just leaves the D, G and B strings. You can download a larger, printable version of this diagram here. To test your knowledge, try the following exercise. Pick any note in your head and see if you can locate it on all 6 strings. At first, you'll be slow, but the more you test yourself like this, the quicker and more "automatic" your note identification will become. You can also try this fretboard trainer and see what score you get. Try and beat that score on a daily basis.